As you can read in my Samsung Galaxy Tab A 10.5 review, it is a very interesting Android tablet with some premium features. But how good is it really? The Samsung Galaxy Tab A 10.5 is a middle-class tablet with a 10.5-inch full HD display, a Snapdragon 450 octa-core processor and Android 8.1 Oreo. In addition to that, it has some premium features like four speakers and can be unlocked using facial recognition. However, with a starting price of around 330 US Dollars, it is quite expensive. Is it worth it? I’m Andrzej for MyNextTablet.com and this is my Samsung Galaxy Tab A 10.5 review. The design of the Samsung Galaxy Tab A 10.5 is very similar to the Galaxy Tab S4 (review) which costs roughly twice as much. As with that one, there are no physical buttons underneath the display. And because of that, the black bezels around the screen are noticeably smaller. I like the design because it looks quite modern. Even though it has a full plastic body, it does not feel cheap and is nice to hold. The build quality is solid and it has a soft texture on the back. Because of that texture, it is not slippery at all. But still, personally, I would have preferred a full metal body. With 8mm it is relatively thick and not super light with 512g either. However, with its 10.5-inch display, it also is a bit bigger than most competitors. The Galaxy Tab A 10.5 is charged using a USB C connector and you can use that one to connect accessories a well. We also get a standard headphone jack, a microSD cards lot and a power button and volume controls. On the left side, there is a PIN connector for an optional keyboard cover. I did not try that one. The tablet features two speakers each on the shorter sides. So it has four in total. The sound quality is pretty good and better than what we get with most tablets. I enjoyed watching YouTube and Netflix because the speakers certainly are good enough for that. However, the iPad Pro and MediaPad M5 series offer a bit better sound. We get an 8-megapixel camera on the back and the front-facing camera offers a resolution of 5 megapixels. The picture quality of both cameras is fine. Yes, most smartphones take better pictures. However, it is good enough for Skype and for some snapshots. You probably noticed by now that I did not mention any fingerprint scanner. Well, that’s because there is none. Instead, you can unlock the Samsung Galaxy Tab A 10.5 using facial recognition. For that, the tablet uses the front-facing camera. Sometimes that works quite nicely. However, often it does not work at all. The facial recognition of the Galaxy Tab S4 or Microsoft Surface Go works much better. These two have additional sensors for that which the Tab A is missing. By now I’m used to just type in my PIN directly to unlock the tablet. The facial recognition often is just not precise enough and takes to long. I wish Samsung would have build-in a fingerprint scanner or at least the Iris scanner from the Tab S4. The Samsung Galaxy Tab A 10.5 has a 10.5-inch display with an aspect ratio of 16:10. It is an IPS panel with a full HD resolution of 1920 x 1200. Since it is an IPS display, the viewing angles are wide. I also like that the screen is laminated and that it is quite bright. It even is bright enough to be usable in direct sunlight. However, it is not as bright as the iPad 2018 (review). I think a full HD resolution is high enough on 10-inch screens. However, if you are looking closely you will see pixels and texts and icons won’t look as sharp. Another reason for that is that it is a bit bigger with 10.5-inches than typical 10.1-inch tablets are. But again, I think the resolution is high enough if you’re holding it normally. Other aspects like contrast and color reproduction are fine too. The Galaxy Tab A 10.5 does certainly not have the best screen out there though. Tablets like the Galaxy Tab S4 or MediaPad M5 10 have much nicer displays. But well, they are pricier too. By the way, there is no version of this tablet that supports a stylus. At least not yet. Inside the Samsung Galaxy Tab A 10.5 runs a Qualcomm Snapdragon 450 octa-core chipset. In addition to that, we get 3GB of RAM and a 32GB internal storage. It supports WiFi ac and Bluetooth 4.2. You can also get it with optional LTE and that one supports GPS as well. The performance of the Snapdragon 450 is good enough for most apps. Chrome, YouTube and other apps like Lightroom or Word run nicely. And the split screen mode works without any issues too. In my gaming test, the tablet gets better results than its predecessor, but it is not as fast as other tablets in this price range. Simple games run fine and among those is Asphalt Xtreme. Into The Dead 2 runs smoothly at medium graphics as well. However, if you set the graphics to high you will see a lot of stuttering. Another thing I noticed is that the graphics of Modern Combat 5 don’t look as nice as they should, especially compared to other tablets in this price class. Players Unknown Battlegrounds Mobile runs fine at lowest settings and I would also call it playable at medium settings which are called balanced. It runs fine most of the time. Sometimes you will see some stuttering though. But as long as you don’t have too high expectations, I think PUBG Mobile is certainly playable. So, in total the performance is good enough for most games. However, it is not a perfect gaming tablet. And that is what my benchmark tests show as well. In the Geekbench 4 single core test and in AnTuTu it is noticeably weaker than the Huawei MediaPad M5 Lite 10. Both tablets are direct competitors with similar prices. The iPad 2017 and iPad 2018 are much faster too. At the same time, it is faster than Android tablets from last year that cost around 300 euros so there is a small improvement here. A big highlight of the Samsung Galaxy Tab A 10.5 is its software. It runs Android 8.1 Oreo out of the box and on top of it sits the Samsung Experience UI. Tablets from Samsung have one huge advantage over other Android tablets. Usually, they do get updates much longer than competitors do. Even the cheaper Galaxy Tab A series usually gets at least one major version update. Other tablets in this price range from Lenovo, Huawei or Acer often get no updates at all. Obviously, I’m not speaking for Samsung and I don’t have any inside information. But based on the past, the Galaxy Tab A 10.5 should get at least one major update. It would have been nice to get vanilla Android. But on top of Android 8.1 Oreo runs the Samsung Experience UI. That is the same interface we are used to from other recent devices from Samsung. I quite like this UI. The design looks and feels more modern than the one from Huawei. And the UI itself and its animations run smoothly most of the time. However, compared to vanilla Android there are some heavy customizations. Even the settings look different. And there are a lot of additional settings. You can even adjust the order in which the three typical Android buttons on the bottom are displayed. There are a lot of preinstalled apps too. Some of them like the files apps and kids mode can be useful. Other like Bixby can be a bit annoying. I noticed one negative point regarding the software. You cannot watch Netflix in HD or higher. It seems like the tablet is not supporting the necessary DRM standard. That often is the case with cheaper China tablet but can happen with more famous brands too. In theory, Samsung should be able to fix this with an update. So, in the future, you might be able to watch Netflix in HD. But certainly not yet. Let’s take a look at the battery life. Inside the Samsung Galaxy Tab A 10.5 sits a battery with a capacity of 7300mAh. In my battery test, that lasted for a runtime of 13 hours. For this test, I’m always looping an HD video at medium brightness and activated WiFi. Compared to other Android tablets a runtime of 13 hours is very good. Yes, there are some that last a bit longer, but most competitors have a weaker battery. Well, that is my standard test. If you are constantly streaming Netflix or are playing games, the battery life will be shorter. But during everyday use, I always got at least 8 to 10 hours of active use. I also like that the tablet does not lose much energy while in standby. I think most people won’t have to charge it more often than every two to three days. Well, except you use it constantly. Alright, that’s my Samsung Galaxy Tab A 10.5 review. Can I recommend it? Considering the price, the display, build quality and speakers are pretty good. And the battery life is excellent and it should receive updates longer than almost all competitors. However, it is a bit disappointing that the facial recognition does not work that well. And the performance could be a bit better but should be fine for most. I think the original price of around 330 US Dollars is too expensive. Really, I think that is too much because for that price you can get better tablets. But usually, tablets from Samsung get cheaper fast over time. In my opinion the Tab A 10.5 gets interesting once you can get it for 250 to 270 US Dollars. But only if you are willing to spend a bit more for possibly longer updates. With this one, it is important that you compare prices. Again, the predecessors got cheaper really fast and that could happen to the Galaxy Tab A 10.5 too. Once it is cheaper, it can be very interesting. However, there are two alternatives which are much better if the prices are the same in your country. One direct alternative is the Huawei MediaPad M5 Lite 10 (review) which usually costs just under 300 US Dollars. Usually, it is a bit cheaper. It’s a 10-inch Android tablet with a full HD resolution as well. However, it features a nicer full metal body, a bit better speakers and an excellent fingerprint scanner. Additionally, the internal hardware is a bit faster and it supports an optional pen. I don’t think the M5 Lite 10 will ever get Android 9 though. Another very interesting alternative is the Apple iPad 2018 (review). Yes, I guess that if you are watching this video, you are probably looking for an Android tablet. But iOS has improved a lot in the last couple of years and has a lot of features that only Android had in the past. It is an excellent tablet operating system. Depending on the country, it roughly costs around 300 US Dollars too. The build quality is a bit better and it has a nicer display. It also will get updates much longer and works with an optional pen. 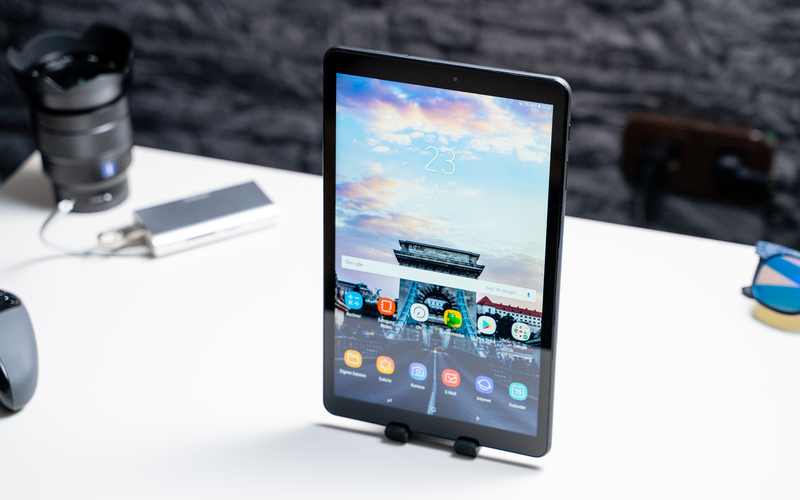 Samsung Galaxy Tab A 10.5 Review:The Samsung Galaxy Tab A 10.5 offers a nice 10.5-inch full HD display, four good speakers, and an outstanding battery life. However, while the performance is good enough for most, it could be a bit better. And the facial recognition does not work precise enough. On the other hand, the Galaxy Tab A 10.5 might get updates much longer than its competition. Couldnot connect pendrive to my samsung galaxy A 10.5 ? Is there a way to connect it.